The Legend of Zelda: Tri Force Heroes will be undergoing maintenance on December 2 (December 3 in Europe). As was previously announced, this is to prepare for the game’s new 2.0.0 update, which adds new stages, outfits, and more. 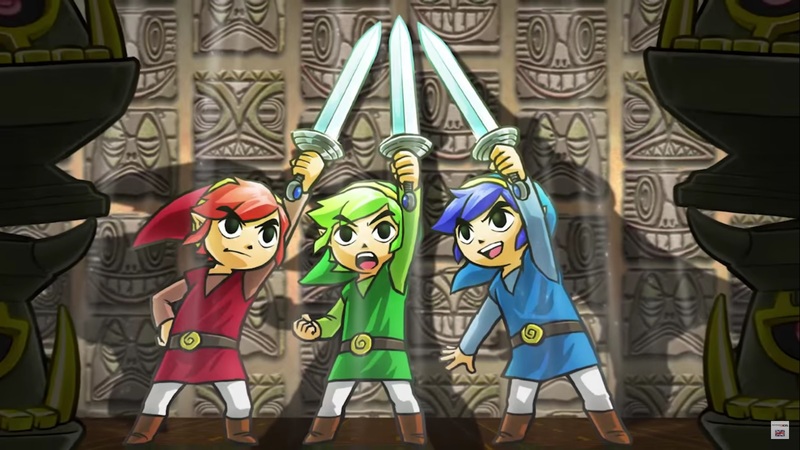 Nintendo has also shared official English patch notes for Tri Force Heroes’ new update. Head past the break to read them in full. – Den of Trials will be added. Over 30 stages will be unlocked in the Den of Trials (each one goes progressively deeper underground). – 2 new outfits will be added. These will be unlocked after clearing certain requirements in the game. – A new method for obtaining Friendly Tokens will be added. Friendly Tokens can be obtained from the street vendor after Princess Styla’s curse has been lifted. – Miiverse stamps will be added. – Players with similar styles of play will be matched up (teamed up) more frequently during online play. Users will be matched up with other players based on their answers to a series of questions prior to being matched up. – Users will be able to add other users to their blacklist if they exit the game through the pause menu during the game. After their teammate exits the game, users will be able to add them to their blacklist by tapping the teammate’s Hero Panel and pressing the A (or B) button before saving the game. – Adjustments will also be made to make for a more pleasant gaming experience.